There has been a lot of interest recently in stable coins and many see them as an ideal way for institutions to trial Crypto-assets as they increasingly turn their attention to this new asset class. However, they could herald many significant changes that impact on the global economy as we see Governments issuing their own coins and Multinational companies using them to pay suppliers, shareholders and staff. Indexedcoin – return based on a known index e.g. S&P 500, FTSE 100 or the CPI (consumer price index). Brandcoin – value backed by a global brand who promises to repay the holder in the same currency as where their registered office is based. A stablecoin has been defined as a Crypto-asset that maintains a stable value against a target price e.g. US$or to put it more simply its price is in essence “Pegged” to a another asset. The search for a stablecoin is not new indeed Vitalik Buterin wrote about such an asset back in 2014. The size of the stablecoin market is currently, $3Billion with Tether dominating the market representing nearly 98% of all stablecoin tradingand it is listed and traded on over 46 exchanges so enabling one to trade 24/7, 365 days a year. It is now the second most traded Crypto-asset after Bitcoin and is in the top ten in terms of its market capitalisation. However, there have been rumors for years about how stable Tether really is given its lack of audit transparency. More recently concerns have been raised about the strength of it’s bank as allegations are raised about Nobel Bankand it’s solvency. Although it has been reported in a Bloomberg article Nobel bank got into financial trouble because Tether and other large clients closed their accounts and stopped dealing with Nobel. So this may mean Tether will not be effected as they have already withdrawn their funds. Despite the concerns and rumors Tether to date has been highly successful and has encouraged many other organisations to create their own stablecoin that has led to there now being nearly 60 of them. allocated $15 millioninto a stablecoin called MakerDAO. One of the reasons for this interest is that some believe that the stablecoins potential is to replace the global money supply which is currently valued at $90 trillion. But in order for any digital currency to become truly global and be widely accepted it is argued that it would have to be able to prove it is scalable, its price is stable, it would be private and decentralised. While there has been considerable attention in Crypto-assets, led primarily by the phenomenal rise in the value of Bitcoin, Ethereum and Ripple many institutions and private investor have been reluctant to get involved with this new asset. Factors such volatility, regulatory concerns and uncertainty in the ability of blockchains which are behind Crypto-assets to be scalable are often cited. Other reasons are people often ask what is backing a Crypto-asset i.e. how safe would my investment be also the whole user experience of dealing in Crypto-assets continues to not be particularly user friendly. 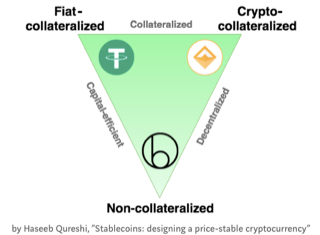 If we look at each of these items it starts to be clearer why stablecoins have become more popular as by their very nature stablecoins being pegged, linked, backed often to a fiat currency are as volatile as the currency they are exposed to. In terms of regulation while the picture is far from clear it was significant that the recent launch of the Gemini coin, pegged to the US$has been officially accepted by the New York Department of Financial Services, the regulatory body associated with banking and finance. In terms of scalability there still remains concerns as to how blockchains can handle large numbers of transactions, but as with many technologies advancements and upgrades are continually happening. Meanwhile companies like Ripple are gaining more traction among global banks as a possible solution to compete with SWIFT that transacts $Trillions a day. Because stablecoins can be pegged to a currency i.e. US$, the concerns over what is behind a stablecoin are potentially answered. However while it not that easy to buy and sell Crypto-assets including stablecoins services like Vega wallet which will allow one to spend Crypto-assets by processingall transactions via a mobile application. So why do we need stablecoins and what are they being used for? One thing that Crypto-assets do well is sending money quickly and cheaply and stablecoins can act as a good interface between traditional assets and Crypto-assets. IBM have recently started to use a stablecoin in it’s day to day activities. “There’s this tremendous opportunity to make blockchain payments feasible, especially for cross-border,” says Bridget van Kralingen, IBM’s senior vice president of global industries, platforms and blockchain. “What is great about this is they are just basically digital dollars—digital fiat currency.” This offers IBM the ability to cut down on the foreign exchange costs and move money faster and not have to rely on the banking system. How long will it be before we see multinationals issue their own “Brandcoins”? Companies like Google, Amazon, Apple, Proctor and Gamble, Esso all who are moving $Billions around the world as they pay their staff, suppliers, shareholders, and the myriad of other stakeholders that they interact with on a daily basis. If they offered those that they transact with an incentive i.e. faster payment or a discount, what % of the organisations that they deal with would accept say Applecoin as opposed to US$. A multinational brand could issue its own stablecoin, having the coin listed on an exchange, with a promise to pay back on demand in a similar way The Fed or The Bank of England promises to pay back if asked. Interestingly, technically most countries with their massive government borrowing are BUST as they need to borrow money to pay the interest on the debts that they have already incurred, while many global brands are sitting on HUGE assets, cash, buildings, stock etc. The US$, Yen and £ are backed by a country’s assets/ability to pay but given the massive amount of quantitative easing, we have seen over the last few years, how are the $Trillions that have been magically created ever going to be repaid? Whereas a global company like Google that publishes quarterly results one can regularly examine how much cash/assets it owns. Currently Google has over $102 Billion of short term investments and cash so why not create a Googlecoin? Fiat collateralised, are easy to understand as they are backed 1 for 1 by cash deposits. Collateralised by crypto, are a little more complex. They are backed by people depositing other Crypto-assets, for example one deposits $150 of ETH and receives $100 of a stable coin. If ETH falls then a smart contract sells ETH for cash to maintain the stablecoin price. A stablecoin that is collateralized by crypto has the benefit of being decentralised i.e. not reliant on the need to have a bank or other institution holding the cash. The collateral is held trustlessly in a smart contract, so users aren’t relying on any third party to redeem it. Non Collateralised. This is the most complex as it algorithmically expands and contracts the supply much like a central bank does with fiat currencies. These stablecoins are not actually “backed” by anything other than the expectation that they will retain a certain value they are the most “Crypto-native” approach to creating a trustless decentralised stablecoin. While easy to see how this works when demand for the stablecoin is expanding, if there was a large reduction it could make large-scale supply contraction near impossible unless other measures are put in place to prevent it. It is by no means certain which of the above types of stablecoin will be the most successful and we may well see other types of stablecoin being developed in the future. To be accepted by merchants and adopted widely all Crypto-assets including stablecoins need to be liquid so enabling people to be able buy and sell and they need to be listed ideally on a number of exchanges. Global digital cash must be fast, cheap, and private. So the platform needs to be able to scale and questions arises who will pay for this, as launching a running a stablecoin would not appear to be that profitable althoughprofits could be generated frompowered products and services (e.g., smart insurance).A decentralised stablecoin could never serve as global, digital cash without some guarantee of privacy. Businesses, governments, and financial institutions using a stablecoin would certainly need privacy guarantees to protect their business interests, relationships, and more. A completely transparent ledger like that of Bitcoin is not usable for these purposes as it is possible to search out potentially who is trading on the Bitcoin blockchain. When will central banks step in? How long will it be before other countries follow the Venezuela Petrowhere the government say “The Petro coin will neutralize the threat of black markets and money mafias across the country”. While some may scoff at the Petro, what would their response be if the Saudis, with their massive oil reserves issued a “Saudicoin”. Imagine the impact on the US$ if Saudi Arabia then priced and sold oil in Saudicoins. I suspect the Russians and Chinese would be happy to not have to buy US$ to trade in oil! Although global banks would not be content to see all that daily foreign exchange business disappear. Volatility is often cited as a key reason why many institutions and individuals are not more engaged with Crypto-assets to date. A stablecoin backed by say the US$, recognised by a regulator that is able to improve the efficiency of moving money especially on an international basis is clearly is attractive. Stablecoins potentially also open up all sorts of possibilities for decentralised applications in insurance, prediction markets, savings accounts, all much more viable with the use of a stablecoin. However, given the existing limitations of scalability and uncertainty as to which type of stablecoin will succeed they may not be the ultimate solution for a digital currency. Is creating cryptocurrencies the right solution to improve cryptocurrencies themselves? Do we actually need a stablecoin? There are existing solutions provided by insurers or by using derivatives many whom are highly regulated, although not without risk as we saw in the financial collapse in 2008. “Stablecoins are helping to usher in a new era of monetary innovation and encouraging established institutions like central banks to re-examine the nature and possibilities around one of our oldest institutions, money, and its role in the financial system”. Previous ArticleIs investing in Real Estate overhyped?